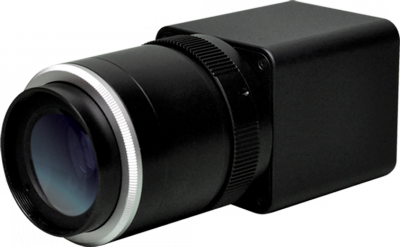 The compact J-Series is Sensors Unlimited’s next generation SWIR digital video camera featuring a 1.3MP high-resolution, high-sensitivity InGaAs imager. The Mini-SWIR™ JSX Snapshot Camera (GA1280JSX) provides real-time daylight to low-light imaging in the Short Wave Infrared (SWIR) wavelength spectrum for persistent surveillance, laser detection, and penetration through fog, dust, and smoke. In addition, the camera employs on-board Automatic Gain Control (AGC) and built-in non-uniformity corrections (NUCs), allowing it to address the challenges of high-dynamic-range urban night imaging without blooming. Camera Link® digital output provides for plug-and-play video with 12-bit images for digital image processing or transmission. The light-weight and compact size enables easy integration into aerial, mobile and hand-held surveillance systems. Optional NIR/SWIR technology is available to extend the sensitivity of Sensors Unlimited cameras down to 0.7 μm, offering the advantage of both Near Infrared (NIR) and SWIR wavelength response. Note: This camera is factory configured to operate at 30 frames per second at full resolution (1280 x 1024). The user can configure the camera to operate up to the max frame rate shown in the calculator at full resolution. * λ = 1.55 µm, exposure time = 33 ms, 17°C TEC setpoint, high gain, no lens, x1 digital gain with enhancement, AGC and correction off. ** In high dynamic range OPR settings, 17°C. Able to achieve 750:1 in highest sensitivity OPR setting. *** Standard configuration Exposure time = 200 µs in lowest sensitivity OPR setting.